When Will Steelers Antonio Brown Peak? The Pittsburgh Steelers have an unqualified star in Antonio Brown. Kevin Colbert and Mike Tomlin saw enough of him to smash Steelers precedent and offer Brown a second contract after just two seasons. But the Steelers and Antonio Brown also have a problem. Antonio Brown is out performing his contract. Brown easily makes the NFL’s top five wide receiver list. Saying he belongs in the top 3 requires no stretch. Neither does it represent a stretch to assert that Antonio Brown is the NFL’s best wide receiver. Yet, Brown’s compensation ranks 14th compared to his peers. His agent Drew Rosenhaus knows this and wants a new contract. Brown has 3 years remaining on the six year contract he signed in 2011. Kevin Colbert has clarified the Steelers will not renegotiate Brown’s contract. And, in terms of understanding this porblem, this is only the tip of the iceberg when you consider that Brown’s performance may have already peaked…. At What Age Do NFL Wide Receivers Peak? When Will Antonio Brown Peak? Several studies over the years, including one this year by numberfire.com, indicate that receivers reach their peak at 26. Brown turned 27 last month. That does not mean Brown’s numbers will decline anytime soon. Those same studies show that receivers don’t severely decline until age 32. After age 32, most receivers can’t match the production they enjoyed in their prime years. The most important number is Brown’s age when his current contract runs out. He will turn 30 in 2018…. Most NFL wide receivers peak after 3 seasons and at age 26. For as encompassing as Juan’s research may be, it included no Pittsburgh Steelers, which is strange because Hines Ward would seem to fit his criteria of having a career that spanned at least six seasons since 2000 and who made at least one Pro Bowl. So the question is, how closely does the peak performance of Louis Lipps, Lynn Swann, John Stallworth, and Hines Ward, in a word Pittsburgh’s wide receivers conform to Juan’s findings? Let’s take a look. The Pittsburgh Steelers drafted Louis Lipps with their first round pick in the 1984 NFL Draft making him the last great player picked by Art Rooney Jr.’s scouting department. 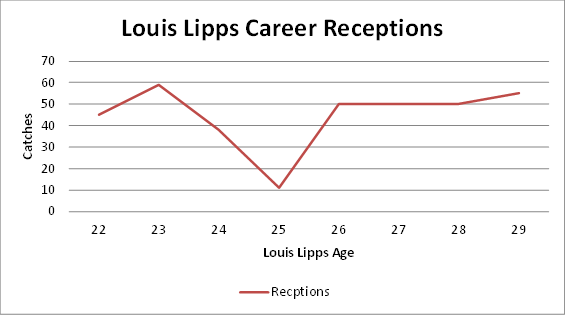 By today’s standards Louis Lipps, whose career receptions topped out at 59, would not be considered an “elite” wide receiver. But when the Steelers drafted him, the 100 yard catch barrier had only been broken twice. Louis Lipps could and did do damage as a Steelers wide out. Before Ben Roethlisberger and Mike Wallace arrived, Lipps and Bubby Brister owned the Steelers long passing record book with Lipps hauling in over 5 passes of over 75 yards. NFL Hall of Famer Lynn Swann needs no introduction to Steelers Nation. Lynn Swann played as a living legend. Swann’s acrobatic catches in Super Bowl X lead even the most skeptical among us to question whether Swann was an angle instead of a mere mortal. While concussion concerns cut Swann’s career short, his body of work still lends itself to Juan’s analysis. Again, almost as if on cue, we see that Swann’s best year came in 1978 at age 26. Unlike the receivers studied by Juan, Swann’s performance dropped off, although his yards-per-catch average other statistics show that Swann remained a downfield threat when healthy. The Steelers drafted Lynn Swann and John Stallworth together and it was their turnkey talent that allowed Chuck Noll to unleash Terry Bradshaw after the NFL shackled the Steelers defense with the Mel Blount rule. As Steel Curtain Rising observed in it’s in-depth profile of John Stallworth (click here to read), Swann was often known as the “big play” receiver while Stallworth was a “possession receiver.” In truth, Stallworth was just as much of a big play receiver as Swann. And, in the context of this article, he proves to be very much the exception to Juan’s research. While Stallworth did post the highest yards-per-catch average at age 26, his best season didn’t come until 1984. Then, at age 32 Stallworth exploded for 80 catches and over 1300 yards, despite that fact that it was David Woodley and Mark Malone who were throwing to him. Hines Ward universally known and loved in Steelers Nation, and while he’s often described as “a linebacker in a wide receiver’s body” Ward built a Hall of Fame worthy resume out of the brute force generated by his desire and determination. 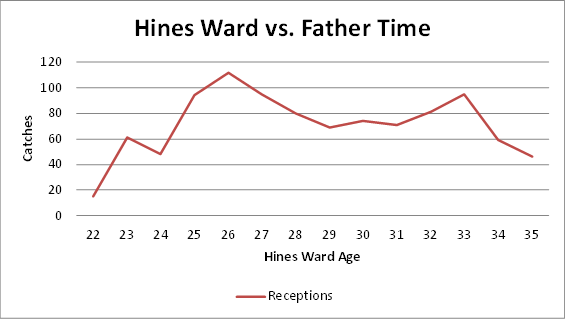 Ward’s performance following was more uneven than Juan’s research would suggest, but one must also factor in the fact that the transition from Tommy Maddox to Ben Roethlisberger conincided with Bill Cowher’s desire to “reestablish the run.” Ward’s performance did perk back up in 2008 and 2009 and didn’t really begin to decline until 2010, although Steel Curtain Rising would argue that even then Ward still continued to make critical catches in ways that numbers don’t measure. If numberfire.com’s Joseph Juan is right, Antonio Brown has already peaked…. Where does all of this leave Antonio Brown? First, with just four other Steelers wide receivers, this sample is far from statically valid. But they played in three very distinct NFL eras, and for wide spectrum of quarterbacks, from Hall of Famers to outright busts to others straddling the average to good continuum. 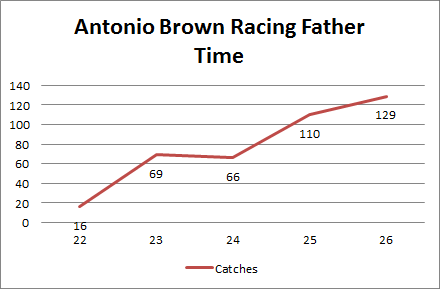 First, the evidence suggests that Antonio Brown has already hit his performance peak. Past performance does not indicate future result, but Joseph Juan’s data says so, and so does the career trajectory of Swann, Lipps, and Ward, with Stallworth as an outlier. But the data also suggests that the Steelers can expect elite performance from Brown for several more years, and a post-30 resurgence isn’t out of the question. But there’s also a downside: 2 of the 4 Steelers wide outs surveyed (Swann, Lipps) saw their career end abruptly. 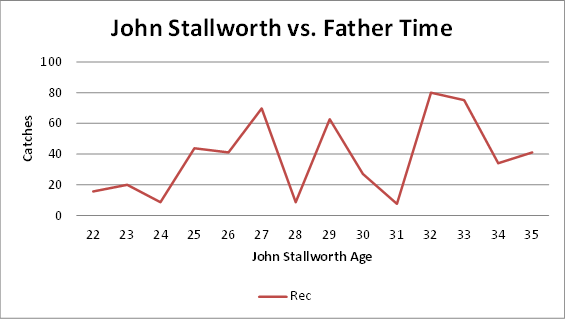 Stallworth and Ward continued to play productively well into their 30’s however. But that dichotomy depicts the coin-flip nature of destiny in the NFL – careers can always end on one play. Steel Curtain Rising has argued that the Steelers should not alter their contract renegotiation stance for Antonio Brown and that position stands. But based on the data, we’ll also say, one more time, the Steelers should guarantee the rest of Antonio Brown’s contract. This entry was posted in Steelers 2015 Season, Steelers Hall of Fame, Steelers History and tagged Antonio Brown, Art Rooney Jr., Ben Roethlisberger, Bill Cowher, Bubby Brister, Chuck Noll, Hines Ward, John Stallworth, Kevin Colbert, Louis Lipps, Lynn Swann, Mike Tomlin, Mike Wallace, Pittsburgh Steelers, Terry Bradshaw, Tommy Maddox. Bookmark the permalink.